What do you do as the Director of Student Affairs for PreK-Grade 3? I support teachers, students, and families, in order to create a high-quality PreK-Grade 3 program where we are educating students on an internationally-competitive level. However, my work is not limited to the Early Learning or Primary grades. I collaborate with colleagues from other divisions and departments within the school to ensure coherence in educational strategies and improvement. Together with my teammates and our school’s stakeholders, we’re working to build and maintain a positive culture for learning that meets the needs of all students and staff. How do you work with the Dean of Students for PreK-Grade 4 Colleen Crable? We work closely together on everything, but I am more teacher and parent focused, while Colleen focuses on the students. We check-in regularly on student progress, both academically and social-emotionally. There is a lot of overlap in our work, and we support each other in everything we do. Colleen spends more time doing character education in classrooms and helping build our social-emotional program, whereas I’m planning for long term growth in the program, advising teachers, and working with admissions. What do you enjoy about BASIS Independent McLean (BIM)? I love working at a school where everyone is striving to be better than we were the day before. With high expectations for ourselves as educators, comes high expectations for our students. We work together, pushing ourselves and our students to be the best we can be. I am also proud that no two classrooms are identical. Our teachers’ instruction differs based on their students’ unique needs and their own diverse backgrounds as educators. Their instructional style and interactions with students reflect the understanding that we are all individuals with our own strengths. What makes BASIS Independent McLean unique? Our families are invested in seeing their students achieve at their highest potential. That’s why they chose our school. We are the experts on their child’s education, and they are the experts on their child. We work together to create an environment that sets each student up for success both at school and later in their lives. What is special about the BIM Early Learning Program? Most Early Learning Programs define themselves and their philosophies in a box: Play-based, Academic, Montessori, Reggio-Emelia, HighScope, Language Immersion, etc. Some programs focus more on creative play or individually-focused learning while others may favor group projects or traditional academic learning. Our Early Learning Program combines the ideas and backgrounds of many philosophies to create an experience that is unlike any other. Each student who enters our program is unique, and each educator and his or her background is unique. Our classrooms build on the individual backgrounds of our educators to meet those unique needs of our students, pulling from best practices across a variety of early learning programs and philosophies. Why are you excited about our Twos Program, which starts in the 2019-20 school year? We’ve seen such great success with students who have gone through our PreK-1 program, and we have learned that the earlier students begin their journey here at BIM, the better off they’ll be in the long run. Our Early Learning Program is one of the foundations of our school, and I’m excited to expand it to reach even more ages and students. What is special about the BIM Primary Program? I am so impressed by the levels of differentiated instruction happening in our Primary classrooms. With our two-teacher model, Learning Expert Teachers (LETs) and Subject Expert Teachers (SETs) collaborate to design lessons that are unique and engaging in ways that meet the diverse range of needs our Primary students have as learners. LETs are the experts on their students and their students’ learning styles, while SETs are the experts on the content. The teachers benefit from the professional support and exchange of teaching practices as they work collaboratively, and the students benefit from increased understanding and greater teacher attention. I didn’t always envision a long-term career in education, but now I can't imagine anything else. When I joined the Washington, D.C. corps of Teach For America as kindergarten teacher, I had the intention of teaching for two years, and then going on to pursue my dreams of a career in investigative journalism. However, it didn’t take me long to learn that there aren’t many things as urgent or as impactful as working in education. That first year, I thrived and learned alongside my students, and decided that I was on this path to stay. As an educator, I’ve grown every day as a leader and problem-solver. I’ve worked to expand opportunities for all students. The triumphs, failures, lessons, and relationships I’ve developed along the way have shaped me in ways I never imagined. Along with many BASIS Independent McLean colleagues, I am currently reading The Gift of Failure: How the Best Parents Learn to Let Go So Their Children Can Succeed by Jessica Lahey. I love to try new restaurants, travel, and dabble in freelance photography. Thanks for speaking with us, Ms. Korik! It's always great to learn more about our staff. Keep an eye on our blog for more staff and teacher spotlights. Ms. Korik began her career as a Washington, D.C., Teach for America corps member, where she taught kindergarten. She was part of the inaugural staff at Imagine Andrews Public Charter School and served as an assistant director at Little Beginnings, an infant through PreK child development center in Arlington, Virginia. Additionally, Ms. Korik supported instructional leadership efforts at School Readiness Consulting, where she helped to coordinate, develop and facilitate professional learning and leadership development opportunities for early childhood and elementary school professionals across the country. She holds an M.S. in Journalism from James Madison University, and an M.Ed. in Early Childhood Curriculum and Instruction from George Mason University. 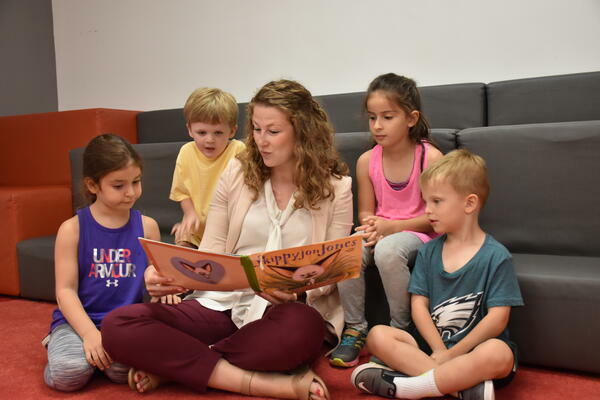 After graduate school, Ms. Korik completed the New and Aspiring School Leaders program at The Principals’ Center at the Harvard Graduate Center of Education.